David Yang is an incoming junior at Bergen County Academies in New Jersey. He enjoys all of the sciences, but is especially passionate about epigenetics, machine learning, and combinatorics. He hopes to apply computer science for research in various fields in the future. In his free time, he takes various online courses, fences, and plays diabolo. The Japanese theorem for cyclic polygons states that no matter how a cyclic convex polygon is triangulated, the sum of the inradii of the triangles remains constant. 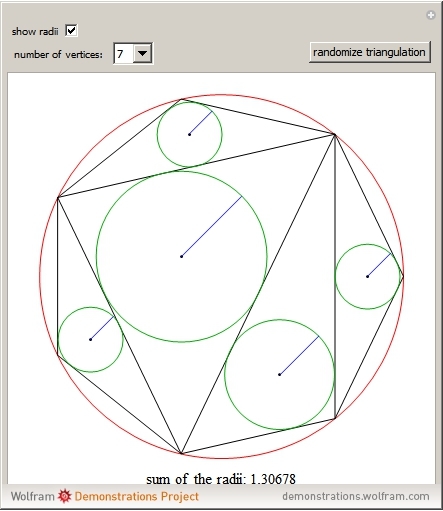 This Demonstration shows random triangulations of regular polygons inscribed in a unit circle as well as the sum of the inradii of the triangles.